RRParks Trading Cards will be providing us with not ONE but TWO promo cards! 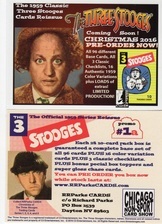 First will be for the 3 Stooges 1959 Reissue Set and the second will be for series 3 of Monster Choke and Gag. 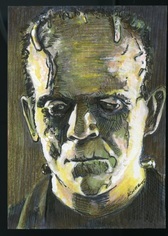 The Chicago Non-Sport Card Show series continues with promo number P13 with art by our creative guest, Rich Kunz. 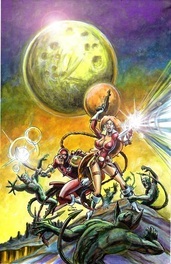 Will Continue their promo card tradition with another great alien promo card from artist Dan Gorman. This will be promo P46 in the ongoing series of Alien themed promos.